Many people have fallen in love with blockchain technology and the solutions it offers in multiple industries. 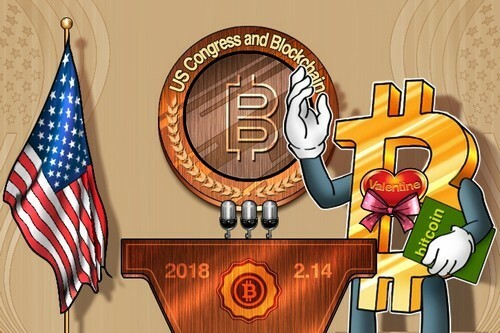 Two subcommittees of the United States Congress held an audience Wednesday February 14th to discuss the applications of the blockchain technology. The audience is named “Beyond Bitcoin: emerging applications for blockchain technology”,discussed by the Subcommittee on Supervision and the Research and Technology who belong to the Committee of Sciences, Space and Technology, in the House of Representatives of the United States. As Congress may initiate a project to support the usage of cryptocurrencies. Frank Yiannas, Vice president of food safety at Walmart (a company that adopted the accounting distributed last year to prevent food fraud). Charles Romine, director of the National Institute of Standards and Technology (NIST). Jerry Cuomo, Vice President of Blockchain at IBM. Aaron Wright, associate professor at the Benjamin N. Cardozo Law School. This would be the second time during February 2018 in which topics related to cryptocurrencies and the blockchain are being discussed in the US Senate. On February 5th, the Committee on Banking, Housing and Urban Affairs of the Senate received Jay Clayton, Chairman of the Securities and Exchange Commission (SEC) and Christopher Giancarlo, president of the Commission of Trade Futures of Products (CTFC) of the United States, where the official agenda was to discuss cryptocurrencies, the rise of crypto-assets, and their emergence in the US market. Clayton made it clear that the SEC does not seek to take cryptocurrencies out of the US market, but instead wants to ensure that these instruments do not cause problems for the domestic economy of the country. Clayton acknowledged that these are disruptive instruments and generate great expectation and optimism among investors, but the SEC must maintain its main objective, which is to protect investors while maintaining strict compliance with the financial rules of the game. For his part, Giancarlo highlighted the great value of the derivatives market for the development needs of the financial system and societies, emphasizing its role in terms of growth and commercial risks, and the role of the CFTC in this regard. Giancarlo recalled that in 2015 the CFTC determined that cryptocurrencies met the definition of ‘commodity’, and that the institution does not have regulatory jurisdiction over markets or platforms that carry out cash transactions in virtual currencies. Thus, the imposition of registration requirements, monitoring, and requesting transaction reports would all be elements that are beyond their scope. However, he clarified the CFTC has jurisdiction to investigate through a subpoena or other investigative powers and could also carry out “civil actions against fraud and manipulation in the derivatives markets” of cryptocurrencies, as well as in the markets of underlying virtual currencies. Giancarlo mentioned the future for Bitcoin meant ensuring derivative products were analyzed by the commission and their launch by CME and CBOE were followed by the institution. He added that there are potential benefits in blockchain technology and its powerful applications. Giancarlo’s interventionmeans he has ‘won the hearts’ of many enthusiasts of cryptocurrencies, and his twitter following multiplied seven times. The declarations of February 5th shows there is still a distrust by US authorities towards the crypto-assets. However, these discussions are a step in the right direction.